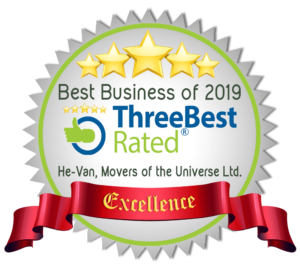 He-Van Movers of the Universe are on a mission to provide a service that surprises and delights our customers in what can be a stressful process. We are really pleased to receive positive feedback and share it with you. 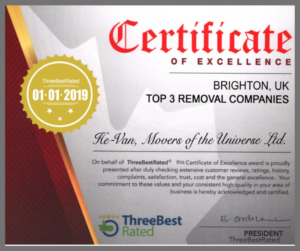 You can check out our older customer reviews further below on this page, and are recent reviews for our Brighton removals service by clicking here. 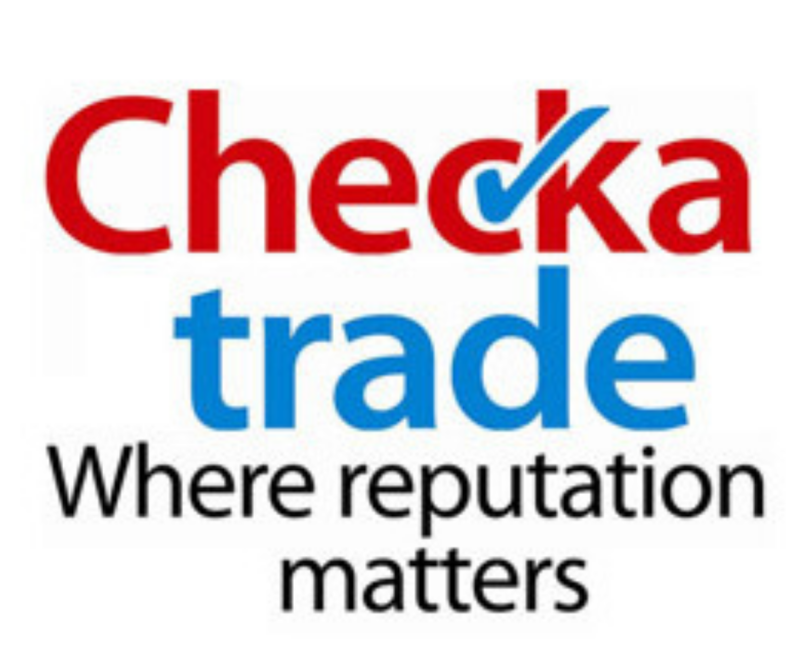 To add your own review on checkatrade.com please click the banner beside. To add a no-fuss Google review, just click the banner beside. Our Google plus page has had an astonishing 53,000 views. Review of He-Van, Movers of the Universe – Brighton Removals & Man and Van from 20 August 2013. I recently used He-Van to move items from storage to my home. Not only was Julian able to arrange my move at very short notice but he also sent me the ‘A-team’ too! The gentlemen that helped were understanding to the delicate situation and went above and beyond to make it as stress free and fun as possible. They even took the time to fix a leg on a table, a grandfather clock and assisted with the ‘Feng shui’ :). From start to finish Julian and his team were professional and friendly. I would recommend this company highly. Many thanks ,Sara. What can i say about HE-VAN MOVERS. I have moved from three different countries and lived in over 60 houses But my recent move was the best Julian moved heaven and earth to make this happen for me so polite friendly and great customer service even the two lovely men and very friendly that came couldn’t be any nicer and professional and extremely friendly. Without any doubt I will use again or recommend. Review of He-Van, Movers of the Universe – Brighton Removals & Man and Van from 30 August 2013. We recently had short notice to arrange the removal and storage of the contents of our mum’s flat. Having tried the so called big companies, none of whom could visit, we were recommended the local firm He-Van. Julian and the team visited and estimated that day, and arranged secure local storage. The standard of work and care was outstanding and the level of personal service, in a sensitive situation, second to none. The value was also excellent. A large saving against the multi-nationals. We have no hesitation in fully recommending this company. This company are EXCELLENT. The perfectly sized van was clean and smart, turned up on time, with two smiling, charming, super fit young guys who did their utmost to shift my stuff up several flights of stairs with the minimum fuss, maximum efficiency and in the minimum time possible. Respectful, professional service, and i was impressed with the manager Julian finding a way to arrange my move for the very next day on a weekend as i had an emergency. They charge reasonable rates too. I would recommend these smooth movers of the universe to anyone with full trust! I moved in June and because they were so amazing – both in terms of job done and cost – and also because we had so much stuff, we got the He-Van guys out twice! I really can’t recommend them enough, they were friendly, worked hard, did a great job (even taking apart the sofa bed and putting it together again to get it in the slim front door!) and as I said, the cost was so exceptional I happily gave them a bit more. Recommended and next time we move, I’ll be calling them again. I contacted he-van to help move me and my family to a 3 bedroom house. julian was very helpful and easily contactable. i booked his company and there was a glitch i booked monday which i could no longer commit to, he was flexible and changed it to friday which was a great help. friday came quickly and both of the removal men were smartly dressed, friendly, helpful and professional every step of the way. both of the members of staff bent over backwards to make sure i was happy with the service provided. They respected our items and handled them with great care. my daughters doll house was quite delicate and the made sure that when they placed it in her new bedroom they did it with care. moving is a very stressful time, but with he-vans help it was made easy. so a big Thank you to julian and his two great members of staff. If you are in the process of moving give he-van a call you won’t regret it! I used He Van to move last year and found Julian and his colleague to be that rare combination of efficient and friendly. Can definitely recommend them and would use them if I were to move again. JulianAnkersmit, 13 August 2013: Thank you Jayne for your review. I would highly recommend He-Van Removals. They did a fantastic job for us. It was a major move! Four days, loads of gear (we’re a household of eight), emotionally challenging and we were moving to a house with five floors. Team He-Van were amazing! Punctual, polite, highly professional and supremely unflappable and very motivated. From helping with the packing, carefully moving fragile furniture and paintings, having tissues at just the right moment, to uncomplainingly schlepping heavy boxes up five flights of stairs, these guys made a potentially difficult move go far more smoothly than I could have imagined! I’d give them 11/10!!! JulianAnkersmit, 13 August 2013: Thank you Nicky for your review. Your move was He-Vans biggest move so far. We were lucky to be moving you from a such a prestigious home (which always makes jobs more interesting). Not only did we do a great job 🙂 but i also found some new friends. He-Van will always be there for you! Great movers! The two guys arrived bang on time and just set to it. It was almost like you would want movers to be – polite, nice blokes who move everything really fast without damaging a single thing. Nothing was too much trouble, as the day went on it dawned on me that actually this was going to be as easy as was humanly possible. They fitted everything into the van, when I seriously doubted this was possible, so the move turned out a lot cheaper than it could have been. Couldn’t recommend higher! JulianAnkersmit, 13 August 2013: Thank you Pete, We have the power to pack a van the way it should be packed! Like you said, it saves you money too. Choosing the right van and not overcharging customers is the way we operate. Thanks for choosing He-Van as your local Brighton removal and man and van service. My name is Julian and I am the owner of He-Van. He Van removals was set up to deliver a professional but low cost Brighton removal service providing the customer with the care and attention that is needed when moving someone from their home or just moving a few belongings. I employ drivers, porters, packers and unpackers, all of whom share the same high level of customer service skills and have over 3 years removal experience. I employ happy and courteous staff who are there to not only move you but offer advice to any questions you may have or problems that may arise. Having the right staff on board and the right approach is imperative to He-Van’s success, future expansion and customers expectations. I believe He-Van stands out from the crowd and the competition because of its professional approach, training and time given to its staff. He-Van is supportive not only to it’s customers but also its staff. I hope that you choose to use He-Van, Movers of the Universe for your Brighton based removal firm. If you need to speak with me in person, just pick up the phone. We moved from Brighton to Eindhoven in The Netherlands last week and used He Van to help us move. We had quite a tight timescale (just after Christmas!) and found that the larger firms needed a lot of notice and were quite pricey even using a budget option. We didn’t have that much stuff to take as we were leaving quite a bit at home in our garage so Julian suggested his hi top van which would keep the costs down and would get most of the stuff we wanted to our new home. Julian and his team were brilliant at moving the stuff we didn’t want to take into our garage and the stuff we did into the van. They used every possible space available to tetris in as much as possible. Very friendly and professional service which made our overseas move much less stressful. The guys packed the van the day before the move and the kept it in a garage overnight. Then Julian left a the crack of dawn the next day, drove to Eindhoven, unloaded and drove back the same day. This also kept the cost down as it meant we didn’t have to pay for overnight costs. Many thanks Julian and the team, great job! JulianAnkersmit, 13 August 2013: Always like going to Holland as i’m a half flying Dutchman! Looking forward to seeing you again on the return trip. Julian and his team made an excellent job, taking out most of the stress of moving house. They are quick, efficient and very nice guys, who put a lot of care in handling our belongings. I will definitely call them again whenever I need their services. I should be allowed two reviews, as I made poor Julien bring me from Lewes to Paris…and then back three months later (don’t ask. Yes, this is the internet and you can’t. But still, don’t ask). He took it apart, lifted it up stairs, put it together, and then did it all over again. I can say without fear of exaggeration, that he is a superhero, with the attendant superpowers. Chapeau! JulianAnkersmit, 23 November 2012: Thanks Scott, Your allowed 3 reviews since were moving you again next week, not as far as Paris but none the less… moving again. Friendly, efficient, professional and patient. Extra points for making the van into a tardis and fit all the stuff in, all neatly stacked together with the aptitude of a master Tetris player. The job got done well and He Van went the extra mile when needed. Highly recommended and would definitely use again. JulianAnkersmit, 23 November 2012: Thanks Alex, I’m glad Chris was the efficient man you needed for your move to London. Hope your are doing okay and have settled in to your new home. He-Van standing by! I hired He-Van to help me move. They turned up on time and got straight to work. Few hours later all the contents of my flat were sitting in my new home and I didn’t even have to move things from one room to another because they made sure to leave the boxes and furniture in the correct place. They even helped me to assemble some of the furniture. I would definitely recommend He-Van to anyone that’s looking for a reliable and friendly removal service. We’ve used Julian and his team twice now, and both times have had a fantastic experience with them. They’re very skilled and friendly, and make the whole experience a lot less stressful. We didn’t even shop around this time, we just went straight to He-van. JulianAnkersmit, 23 November 2012: He-Van Brighton Removals …. yes skilled and friendly … and super quick, super careful and super people 🙂 See you next time Owen. He-Van saved me after another company let me down the day before my move. Very happy – Julian arrived promptly, my possessions were handled with great care and loaded in the van quickly and with great skill. Julian is friendly, efficient and extremely easy to get along with. All this combined made my move a lot less stressful than it could have been. Thank you He-Van! Julian and Jake were fantastic on move day, I had stupidly booked the small van (am obviously not as spacially aware as i thought i was!) but they managed to squeeze a huge amount of stuff into a very small space! They worked very fast and the whole move from Warlingham to Brighton took just over 4 hours. Would definitely recommend using He Van. Thanks Julian! Not only was he friendly, knowledgeable and efficient, he went above and beyond the call of duty. Our sofa wouldn’t initially fit through the door, so he took it off the hinges and reattached it afterwards! We couldn’t have moved without him. Julian and Jake were the best, we so enjoyed moving with them, from the start when we first made the call to book, cancel, book etc for a while, they then arrived and loaded the lorry in amazing time and so neatly it was shocking that all our house fitted into one little lorry. The unloading was just as good, the price was also reasonable and we are happy to pay the bill, the weather helped being sunny all day. Both Julian and Jake were well looked after by us as well, they enjoyed several cuppas to help the day move on so well and the bacon butties were also appreciated by all of us who were loading the lorry and chatting. Both are so polite and nothing was too much trouble for them, they even moved our cast iron wood burner, so many thanks to both of them for that. I would recommend them to anyone who wants a friendly moving company, if we were contemplating moving again (which we are not) we would definitely use them again, also as we have moved into a 500 year old house in need of restoration Julian and Jake have been invited back to see our hard work. Many thanks to you both, Helen & Geoff. Exceptional service! He-Van took on a particularly difficult job for me, all the way from Dusseldorf, Germany to Brighton. I was particularly nervous given what a big job it was and how I absolutely needed someone reliable but Julian delivered excellently. He took care of all the bookings and administration and was a pleasure to deal with. Top marks, thoroughly recommended brighton removal company. JulianAnkersmit, 21 May 2012: Hi Jenny and Alex, So happy to hear you had a great experience, I try to do most jobs myself but am happy that my team can do it just as well as i can. Enjoy London and all the best. These guys are excellent. They were punctual, polite and respectful of the stress moving house can cause. I would recommend them to anyone. They are a cut above your average man and van because they genuinely care about the quality of their service. I felt completely at ease with the team and they completed the move in good time. Their attitude is really pro-active, they even screwed the feet back on my sofa for me. You can’t complain at that. He-Van definitely live up to their five star ratings. Hire them and it will be a job well done. Fantastic professional service and great people to have around when under the pressure of moving. They made it fun! Highly recommend He-Van!!! 5 Star service. Thank you, Penny (Leeds). Excellent. Turned on time. Really friendly staff And reasonably priced. nothing bad to say at all. 5 stars – I couldn’t have wished for better help with moving, thanks Julian! He was professional, efficient and friendly, and amazing value for money. I would recommend him to anyone, and will certainly be using him again in future (but hopefully I won’t have to move for a while). My second move in the last 6 months and buggered if I was doing do repeat the nightmare of doing it alone again! Julian certainly lived up to the name He-Van and I would certainly recommend him to anyone looking for somebody reliable, efficient, reasonably priced, timely and friendly to help them move. I moved from Brighton to London and the distance was not a problem at all. Thank you for making my move such a pleasure Julian! If I move back to Brighton I will certainly be using your services. JulianAnkersmit, 8 March 2012: Thanks Julia, for your very kind review. You and Andrew have qualified into He-Van’s record books for the longest removal thus far. 4 days of packing and moving and 3 days unpacking. It all went very smoothly and it has been a pleasure to meet you and your family. Thanks again. I would recommend Julian to anyone, I was dreading moving and he made it so easy! Right before Christmas he turned up with a smile on his a face and moved all my stuff (which wasn’t particularly well packed by me) all the way to London. If I was moving back into the area I would definitely use him again. Julian and the boys were great. They were very professional, efficient and friendly and would recommend them. We will certainly be using them again. Thank you again for making the day so much easier especially in the unexpected heatwave. Amazing removal men.. took the sting out of moving ! had to move to a basement flat and the guys managed to get my leather sofas down very narrow steps. Brilliant service from easy-going, unflappable he-men: reliable, professional and very gentle with the precious things! I’m using them again next week! My wife and I had a tricky move from a ground floor flat to a 2nd floor flat up 3 flights of narrow stairs. The guys were very professional and didn’t seem fazed, even by the massive chesterfield sofa or the washing machine. They made it stress free and we’d definitely use them again! From the first call Julian sounded very professional and I knew it was a top choice. He was very friendly, very reliable and helpful. In fact, he called me the evening before the move to ask if I want to change the time from afternoon to morning as his other job was cancelled – so thoughtful! The whole move from Brighton to Newhaven was very quick and painless. I will definitely recommend He-van to anyone who is moving and will call Julian when I need to move again. Thank you lots!!! He also didn’t freak out when there was nowhere to park outside our new flat or that we had to haul everything up 4 flights of stairs, nor did he bat an eyelid when we had to wait a while for the keys to arrive. We had a lot of laughs and it was actually fun, considering that moving is everyone’s worst nightmare. Best removals service I’ve ever used! Prompt, efficient, helpful beyond expectations…. all with a smile on a Saturday morning! Thanks Julian for the fantastic service and for making the move so much fun! By the power of greyskull !! He-van shifted our stuff from Brighton to Newcastle (yes, Geordieland!) I couldn’t have asked for anything better. STRONGLY RECOMMENDED. Thanks Julian, all the best from Hazel and Melanie. The BEST removal company i have EVER used, i cannot recommend them highly enough. This is the second time i have used their services and will never go anywhere else from now on! Julian was punctual :), fast, yet extremely careful with everything and didnt complain once when faced with 5 flights of stairs :(. Brilliant brilliant brilliant. Hire them, you wont regret it!! Julian and Dan made the upheaval of moving house as smooth as the proverbial young bum. They arrived on time, quickly sussed out the situation and set to packing up the van taking the utmost care of everything, particularly Stevie the Hamster (most precious cargo of the day). Nothing was a problem, even the awkward access to the new flat and everything went in fine and surprisingly quickly. He-Van are professional, reliable, good value and above all bloody nice blokes. You’ll be glad to take them for a pint afterwards. I recommend them highly and would not hesitate in using them again. A really friendly guy. Fast, efficient and good value. A definite recommendation. Great van as well!!! I used these guys a few weeks ago and they were fab. I did a bit of shopping around beforehand and they were briliiant value compared to the other people I spoke with. The whole thing was hassle free from start to finish and what could end up being a rather stressful day ended up being a bit of a laugh! That makes all the difference when your moving! My things were treated with care and nothing was too much hassle. He-Van has got to be one of the slickest transporters on the road, not only reliable, efficient and value for money it has the fun factor that my kids loved, making moving house so much more smoother. Julian was relaxed and respectful i will be recommending He-Van to my friends and my kids keep asking me when can we go camping in the He-Van! I hope to see more He-Vans on the roads in future. Rani&Co. Just want to say a big thank you for helping me and Dani move from Brighton to the storage center. I am back in Italy now, but when I come back to UK, I will be sure to use He Van again. I highly recommend your service to anyone who needs a man and van in Brighton. Thanks again and have a good summer! maxineb, 4 April 2011: Julian What can i say!!! !